Mabie Law Library has nutshells, hornbooks and other study resources available for use by law students. Typically, the latest editions of the nutshells and hornbooks are available in the Stauffer Reserve Collection, unless a professor has placed the title on course reserve. You can search for either hornbooks or nutshells in OSCAR, the library's online catalog, by searching by title for the phrase: hornbook series or nutshell series. Other series students may find of interest are: Black Letter, Law School Exam Series, Examples & Explanations, Siegel's, Exam Pro, Legal Text Series, Questions & Answers Series, or the Understanding Series. Please check with the reference staff if you need assistance in finding a title. The library staff recommends that you utilize the exam indexes first to locate exams. If no exams are available for your course or professor, check the Course Reserve Lists on OSCAR. Finally, you should check the personal website of the faculty. Acing Your First Year of Law School : The Ten Steps to Success you won't learn in class. 2nd ed. by Shana Connell Noyes & Henry S. Noyes. 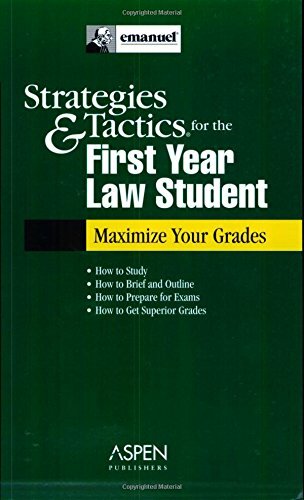 Provides advice for the first year law student on a variety of issues and strategies to help them avoid the pitfalls that are common among first year students. This text provides advice that can assist the student in making the transition from college to law school. The authors explain: the "why" of law; the "how" of law; and the "what" of law. The authors also offer suggestions and tips on time management, exam preparation tips, and other resources to help the student "bridge the gap". The authors provide law students with explicit frameworks for reading and analyzing court opinions in all first year courses. Using hypothetical classroom dialogues, the book explains how these frameworks will help student understand and participate in classroom discussions, answer questions on exams, and use the skills learned in the first year when representing clients in practice. 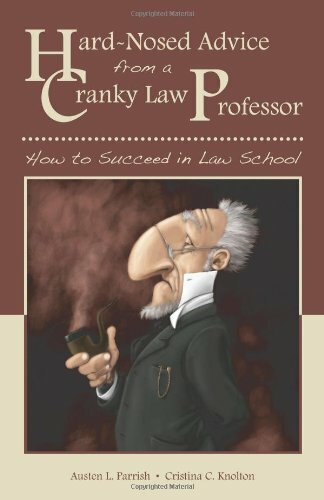 This book is designed for new law students who would like to improve their chances of doing well in law school. Written from the perspective of a cranky, cantankerous professor, the book side-steps pleasantries to provide no-nonsense, sometimes hard-nosed advice that is intended to instruct students on what they must do to succeed. While blunt, the practical advice is provided in a light-hearted, humorous way. The book's aim is to give concise answers to questions that most students have when they begin law school. This text offers fresh insight into law school exams. It covers time management, outlining, and case briefing techniques. This text is written to help law students starting on day one with one thousand pages of assigned cases. Its immediate suggestions, examples, and tips are invaluable. Law School Fast Track is also unique in that it focuses simply on the first week of law school - emphasizing the importance of establishing and maintaining good habits. This text offers a very comprehensive look at the law school experience. While the main focus is on law school academic success strategies, the book also covers critical information such as joint degree and concentration options, study abroad, extracurriculars, and career planning. There are also sections on legal research, legal writing, and writing great law school exams. For those looking ahead there is a section on the Bary Exam and Career Planning. Learning Outside the Box: A Handbook for Students Who Learn Differently by Christensen, Leah M.
The purpose of this book is to provide research-based learning strategies for law students who learn differently. If you are a student who has been diagnosed with a learning disability or if you simply have a unique learning style, you may need to outline differently, read cases differently, and approach law school in a more active, engaged and efficient manner. This book offers learning strategies grounded in empirical research to help law students who learn differently maximize their academic success. Learning the Law shows the reader what it means to think like a lawyer. It introduces you to legal reasoning and some basic jurisprudence. It also takes you beyond graduation and explains what lies ahead. This text gives you a detailed, step-by-step program for surviving the first year of law school. There are sections on sharpening your note-taking skills, dealing with pressure and exam taking tips. This edition of the book has several new chapters that are geared toward success both in law school and in the job market. A new chapter on legal analysis addresses one of the most common problems professors see on law school exams--the absence of the counterargument. New materials on interviewing techniques, creating a writing sample, and writing a resume are designed to help students market themselves to prospective employers. Whether students are seeking advice in the summer months or are looking for help once the school year has begun, this book is an important tool for helping them get the most out of their abilities. This text guides students from the summer before starting law school straight through to their first clerking experience. It is a practical, step-by-step guide that uses exercises, worksheets, and checklists to help students identify their needs, plan strategies, and organize their efforts to maximize success in law school. 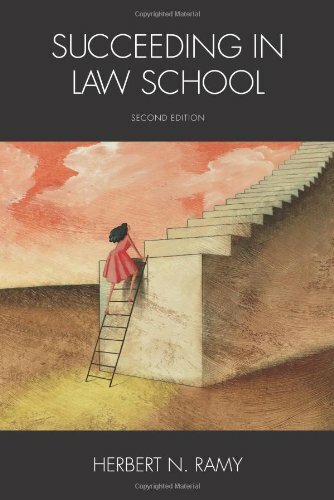 This text offers a comprehensive approach to succeeding in law school. The author offers practical advice for doing well during the classroom Socratic Method, managing law school stress, and doing well on final exams. If you haven’t started law school yet, you’ll want to include a new suit in your list of back to school supplies. You’ll not only need it for job interviews, but if you plan on taking part in moot court, you’ll have to wear one, too. But at $200-$300 a pop, suits are expensive, especially for a starving law student like yourself. Here are 5 tips on how you can save tons of money on your next suit, but still look like a million bucks. Here’s a list of 180 money saving tips that can turn your financial life around 180 degrees. The Center for Computer-Assisted Legal Instruction is a non-profit consortium that creates tutorials for first and second year law students. They are typically Flash-based and include quizes, examples, and interactive illustrations. Some students find these to be very helpful for preparing for exams.